Petropavlovsk-Kamchatskiy to Anadyr: Combining the best of our ‘In Search of the Spoon-billed Sandpiper' and ‘Wake of Bering' Expeditions with new added opportunities.
" From the moment we left Avacha Bay and a Tufted Puffin appeared out of the fog, we knew it was going to be a special trip.In those 2 weeks were spectacular views of Steller's Sea Eagle, multiple sightings of Brown Bears (safely from our zodiac! ), and amazingly curious walruses. Not forgetting the thousands of seabirds, and seeing Orcas and other whales from the deck. Rodney runs a tight ship but we all appreciated it out in this remote part of the Pacific.The accommodation was comfortable and the food was excellent. The expedition staff made sure we all had great experiences. The birdwatchers' icing on the cake was seeing the Spoon-billed Sandpiper at its nesting ground in glorious summer plumage. The trip far exceeded expectations and we felt very privileged to be able to be part of it. " - Barbara and David, Perth Aus.
" Dear Leanne, I would be grateful if you could pass on my thanks for an outstanding expedition to those concerned. Lindsay and Cath produced beautiful meals and their careful presentation combined with their sunny disposition made it feel that I had been invited in to their home rather than eating in a restaurant. I did not require Cam's professional services but we had some great chats over meals and I trust my tomato recipe will go down well with his wife. Dan and Chris diligently and enthusiastically pointed us in the right direction to see the wildlife and you could see the interest amongst none birdy clients grow day by day. You had to arrive early to get a seat at the reading of the checklist. To witness the care and field craft used to allow us to see Spoon billed Sandpiper on the nest was truly memorable and typifies Heritage's attitude to putting the wildlife first. Multitalented Meghan, Katya and Rodney work so hard in so many ways to make each day memorable. "It is now 0630 and breakfast is served" has never sounded so good and that early positive greeting always got the day off to a good start. Rodney's briefings never failed to whet the appetite and Katya's lectures on the indigenous peoples were both thoughtful and inspiring.
" 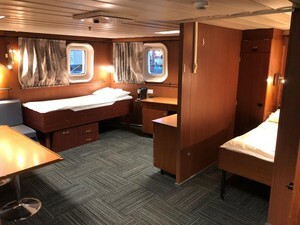 "I recently went on the "In the Wake of Bering" cruise with Heritage Expeditions which travels north from Petropavlovsk-Kamchatskiy to Anadyr (a couple of degrees shy of the Arctic Circle) along the east coast of the Kamchatka Peninsula in the Russian Far East. It was an amazing expereience. Being my first sea voyage and visit to this area, everything was novel and exciting - even the fact that I quickly got over my one small episode of seasickness on the first evening and nothing further. 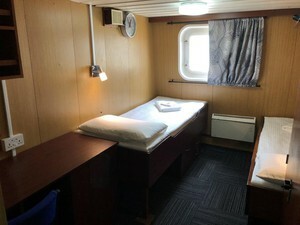 I enjoyed the fact that the ship,Professor Chromov, known by its original name in Russian waters, is small enough that you get a chance to get to meet all the passengers and many of the friendly Russian crew. The whole organisation of the daily activites, the meals and the helpful staff was wonderful. Every day we had at least one jaunt in the Zodiacs with landings on the coast and islands off shore so we had opportunity to see both land, sea and shore birds and mammals, sometimes at quite close quarters! The ever changing scenery from the volcanoes in the south (though often obscured by cloud) to the beautiful flower-filled tundra in the north was magnificent. My main reason for the cruise, the birding, exceeded all expectations and with the help of the Heritage and Nature Trek ornithologists (and not to mention many of the very knowledgible fellow passengers) I learned to recognize the Jiz of many northern hemisphere birds new to me. It was great to see some of the waders that I had previously known only in their non-breeding plumage in the southern hemisphere. Of course the Highlight was seeing the rare and increasingly endangered Spoonbilled Sandpiper. We were very lucky. We also saw walrus, sea-otters, sea-lions, different species of seals and whales, many bears, snow sheep, Arctic fox and some of the smaller mammals. The many beautiful flowers seen on our walks on the hills, marshes and tundra were identified by the enthusiastic and knowledgible staff botanist. It was also very interesting to see and learn about some of the history and culture of this part of Russia. 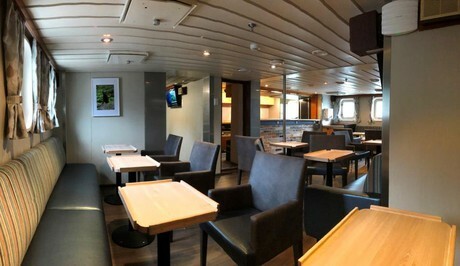 I am thrilled to have had the opportunity to go on this cruise and have many photographs to keep refuelling my memories!
" As a professional bird tour leader, I was impressed by the job that the staff did on this trip, especially in attempting to balance the needs of various interest groups. Chris and Adam are exceptionally knowledgeable birders, and I really appreciated the knowledge, spirit, and skill of all of the Expeditions staff. Having Evegeny and Elena from Birds Russia aboard was a real treat as well. The birding, mammal-ling, and scenery were all fantastic. And Spoon-billed Sandpiper on the breeding grounds! " " “The experience has changed my outlook on life, I am seriously considering returning”. "